Dashmote was happy to be one of the winners of Xplore US, a contest for innovative SMEs and Scale-ups organised by the Netherlands Enterprise Agency and commissioned by the Dutch Ministry of Foreign Affairs. 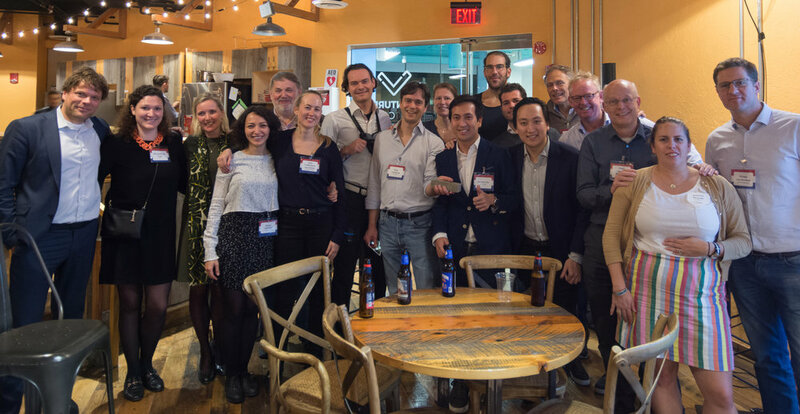 Now that we are back in Amsterdam, it is time to reflect on this programme and share our insight on why Boston’s startup ecosystem is unique. While doing so, we’ll name the top five reasons we believe Boston should be the next city that Dutch entrepreneurs should consider when looking to expand their businesses abroad. One can hardly talk about Boston without addressing the city’s renowned knowledge institutes. The city and its surrounding areas account for over 50 institutes, with Harvard University and the Massachusetts Institute of Technology being world-class. These knowledge institutes alone already deliver a staggering amount of talent. Although Boston’s main concern was a significant “brain drain,” numbers now show that this is starting to positively turn around. Both tech and business graduates in Boston contribute to the creation of new businesses, as well as providing improvements for existing tech giants such as Google, IBM, Facebook, Amazon, and Uber whom all also have locations in the Boston area. Boston also has the highest concentration of millennials in the United States, with more than one-third of the city’s population being between 20 and 34 years old. The city is very culturally diverse, and is often referred to as being the ‘most European’ city due to its old architecture and rich history. With a mix of millennial aged people and old city values, Boston is an interesting combination of new and old which is enticing for European based startups and entrepreneurs. For the second year in a row, the United States Chamber of Commerce named Boston as the best city for fostering entrepreneurial growth. Their rankings focus on ‘next-wave startups’, and is abundant in technology-driven companies that are developing innovative solutions to complex challenges in different industries. The city of Boston focuses on topics such as life sciences, digital health and biotech, and with MIT just around the corner, technology has become the underlying theme of these companies with a preference for deep technology. Deep technology startups are defined as companies that are founded on a scientific discovery or true technological innovation. Next to the presence of qualitative human capital, Boston ranks third worldwide when it comes to venture capital investments. With 3,144 billion dollars the city accounts for a 7,5 percent share of the global venture capital investments. Although the Bay Area accounts for twice the money, what makes Boston unique is its focus on rapidly growing sectors. Boston based startup companies mainly focus on life sciences, digital health, and educational tech related sectors. Therefore, investors in Boston can certainly be described as more conservative than their West Coast counterparts, who are generally more willing to invest huge amounts of money into companies that are targeting the consumer market. A great startup ecosystem requires places where all facets comes together, and Boston has multiple hubs where these interactions take place. The center of the city is currently home to over 500 Bostonian startups and is often referred to as the most innovative square mile on the planet and Kendall Square is Boston’s main startup hub. Next to having all the tech giants such as Apple, Google, Amazon, Microsoft, and Facebook present, the Cambridge Innovation Center is located here as well. It is fascinating to see that the startups which are now responsible for the city’s economic growth were non-existent in the beginning of the 21st century. While tech giants experienced a major economic hit during the stock market crash of 2008, the city’s economy amazingly kept on growing because of its investment in startups. Boston receives a lot of praise for the extent to which its startup ecosystem is connected, and the government has played an important role in the process of bringing the right parties to the right tables. Mayor Martin J. Walsh continually supports starting businesses by means of funding or other governmental instruments which is encouraging for those who are looking to bring their company to the United States. One example is the city’s latest investment into two digital health innovation labs. Another example is the collaboration with IBM to design an online platform to connect, support, and grow the city’s startup community. The borders between knowledge institutes such as MIT, and corporate companies such as IBM are paper-thin, which keeps the innovative atmosphere of Boston thriving. Apart from efficient internal connectivity within the city, there is external connectivity. This means that instead of an 11+ hour flight, one can fly from Amsterdam to Boston in about 8 hours. More importantly is a manageable time difference, and with Boston running only 6 hours behind Amsterdam, there is still a window to communicate with colleagues or business contacts without having to stay late after work or to get up in the middle of the night. This is a huge difference compared to the Bay Area which differs an entire workday (9 hours) from Europe.